I don't think I've ever reviewed the sequel to a book the week after I reviewed the first book, but I enjoyed Awkward by Svetlana Chmakova so much (see my review here) that I had to recommend its sequel, Brave, this very week! The main character of Brave (a graphic novel, like Awkward) is Jensen Graham, who was a minor character (mainly serving comic relief) in Awkward. Jensen sees each school day as a series of obstacles that he has to overcome before getting to attend art club (the same art club that played a major role in the previous book). These obstacles include math class, taught by a teacher who is mostly unsympathetic to Jensen's struggles in the subject, and constant bullying, usually due to Jensen's weight or obsession with preparing for the apocalypse (be it due to zombies or, as he was worried about in Awkward, sunspots). Art club starts to become unpleasant as well, as some of his fellow club members start to exclude and make fun of him at every turn. Jensen's only source of relief becomes doing chores for the school's newspaper crew, Jenny, Akilah, and Felipe, whom he has admired for a long time. 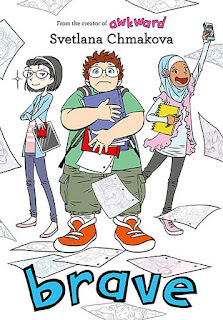 Throughout the book, Jensen starts to rockily make friends with these three (and some other students), but conflicts with the other students as well as schoolwide drama due to the school's dress code (which prohibits short skirts) put Jensen's existing methods for surviving school to the test. As in Awkward, Chmakova is a master at creating compelling characters with distinct personalities. Jensen is lovable and fascinating, and you will find yourself rooting for him and feeling alongside him as the graphic novel progresses. 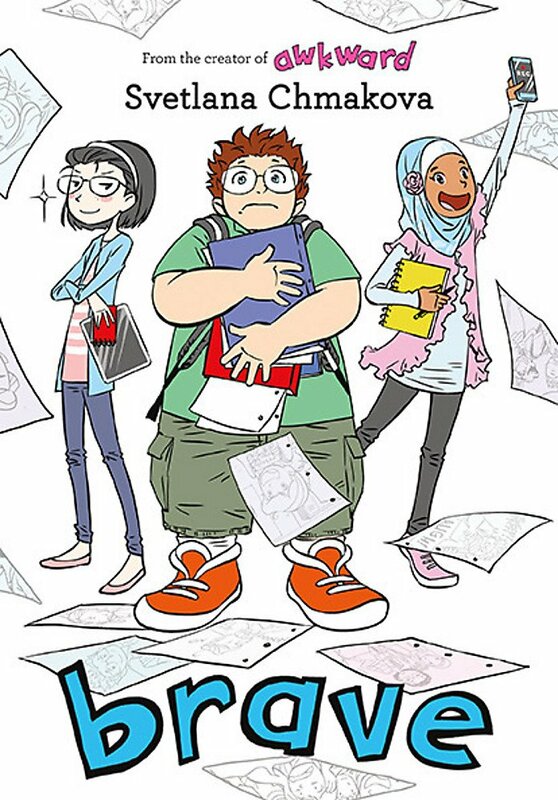 Other great characters include newspaper crew members Jenny, the controlling editor who flip-flops between being friendly and kind, panicked and exasperated, or downright furious with no warning, and Akilah, Jenny's best friend who stays constantly kind, especially to Jensen, and pushes back against Jenny's more unpleasant attributes. Also as in Awkward, most of the students in Brave are willing to work hard and stand up for what they believe in, and watching their plans unfold is exhilarating and gives hope that good people still exist in the world. Bullying is a major focus in Brave, and it pointed out to me that one reason students do not speak about or report bullying is that they are simultaneously embarrassed and in denial about it (although luckily, Jensen's denial is not drawn out as it is in some other books). Rarely do I see sequels that are as good as the first book (especially when that first book is one of the rare books that I found myself reading in every spare second), but Brave is an absolutely spectacular book that every reader will rush through and think about for weeks after! P.S. I will not have a review this next Monday, July 23, but I should be back by July 30. I also have a signed book giveaway coming up in the next few weeks, so stay tuned! I love sequels that feature a minor character from the first book. Gary Schmidt comes to mind as an author who has pulled this off successfully. Brave is for sure going on my reading list. The fact it is as good as Awkward sold me. Thanks for your thoughts and have a great week off! It is great to learn more about a character you might have been curious about when seeing them in the first book. I'm glad you want to try Brave! I really enjoyed BRAVE! The author seems to capture the concerns and dialogue of kids so well. I'm glad you liked it! I agree—it's so realistic! After reading your review of Awkward, I bought a copy to add to a large box of books I'm giving to our Children's Hospital Christmas in July party. Wished I'd seen this one too. Look forward to reading both, myself. That's so nice of you to donate books—I should really do that! I’m glad you want to try both books as well! Sounds great! Thanks for the recommendation! I'm not much for graphic novels, but you make this one sound very worth the time. Thanks for the review. It's definitely worth the time—especially considering that one could probably read it in just an hour! It's always so exciting when you find a sequel that really wins your heart! I'm glad this one was able to do that. Thanks so much for the recommendation!